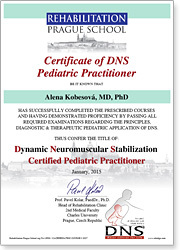 DNS certified pediatric practitioners are clinicians who have satisfactorily completed extensive DNS training coursework with the addition of pediatric skills. They have at least 3 years of clinical DNS training. They have passed all tests associated with their training, and demonstrated competency in both knowledge and skill execution in the application of the diagnostic & therapeutic principles of DNS. They have earned the title "Certificate of DNS Pediatric Practitioner" (DNSPP) issued by the Prague School of Rehabilitation, Prague, Czech Republic.